The spontaneous proliferation of devices, IT trends, and expanding employee devices at work- the stage is set to redefine enterprise mobility as an instrument of growth and visibility. Technology is a dynamic process and for every business it is imperative to stay connected with the latest technology to enhance profitability. According to the current economic scenario, Enterprise Mobility is becoming a vital aspect of businesses, as it takes business and office mobility to the next level. Now businesses are going mobile across the world, and enterprise mobility is a trend towards a shift in the work culture and work habits of employees who are using platforms like mobile devices and cloud services to perform business tasks. With this fast paced world, it is critical to understand all the benefits and uses of any newly adopted technology. So before implementing Enterprise Mobility services to your organization just find out; how it boosts productivity and gain a competitive edge in the global marketplace. At Wintellisys, we offer Enterprise Mobility Suite including azure active directory premium, Microsoft in tune, and azure rights management services that are capable of providing organizations with such an edge in many ways. Consolidate the Entire Data via Cloud Storage Service: Enterprise mobility ensures that the employees can upload the information from the desktop PC to cloud storage service provide to them. And they can further access it from their personal device. Improve Employees Productivity: Enterprise Mobility Services has the ability to keep employees connected and productive, while on the move. Nowadays, all the mobility solutions are directed to ensuring that employees/field workers on-the-move remain connected to enterprise networks and have access to key organizational resources even from remote locations to ensure maximum employee productivity. 100% Customer Support and Satisfaction: Enterprise Mobility Suites allow organizations to interact more effectively with customers through various CRM applications and improved customer-company interaction. The improvement in customer-company interaction allows organizations to provide superior customer support. Visible improvements in customer support lead to reduced response times and generate superior customer satisfaction. Superior Data Security: Security is an essential aspect of any mobility solution deployed for enterprise use. Currently developers are ensuring that organizational data is adequately secured by implementing various security solutions such as Digital Signature, Identity Provisioning and Encryption. Additionally, most mobility devices are also configured to support remote wipe and an additional encryption/authorization measures to ensure compliance with current data security norms. Protection of potentially sensitive business data from unauthorized access has thus emerged as a critical differentiating factor in the current enterprise mobility market. 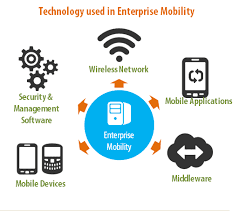 Having discussed with benefits of enterprise mobility, the next thing that you should know is how cloud and enterprise mobility are emerging trend? Well, at Wintellisys, you can envisage both the above services. The classification of technology services is not based on anything other than the customer’ need and expectation, without burning the hole on your profit- Wintellisys is a top-notch solution for your entire problem. Very usefull information. thank you for sharing with us.